N.B: Includes adjustable legs with locking wheels, guard rail frames, full platform boards with one trap door, toe boards and outriggers where necessary, internal ladders and intermediate landing stages with trap-door. When working inside or outside a building at great height the person performing these tasks needs to have reliable equipment that will keep the user safe, while helping them to work efficiently. Our heavy duty aluminium span towers provide a safe working platform for an individual working at height. They have automatic quick adjustable leg locks for safety, as well as locking castors, guard rail frames and full platform boards with one trap door. Other features are toe boards and outriggers where necessary, along with internal ladders and intermediate landing stages with a trap-door. For safety and reassurance these towers conform to all British Safety Standards (BS1139 part 3) 1994/HD1004. There are two types available; single span (0.75m wide) or double span (1.3m wide) towers. They are also available in a choice of four platform heights; 3000, 4000, 6000 or 8000mm. 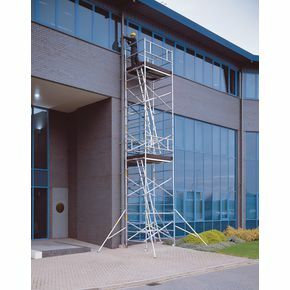 Our heavy duty aluminium span towers are an excellent choice to help a user to work safely at great height. They come with a 10 year warranty, 12 month guarantee and FREE UK Delivery.